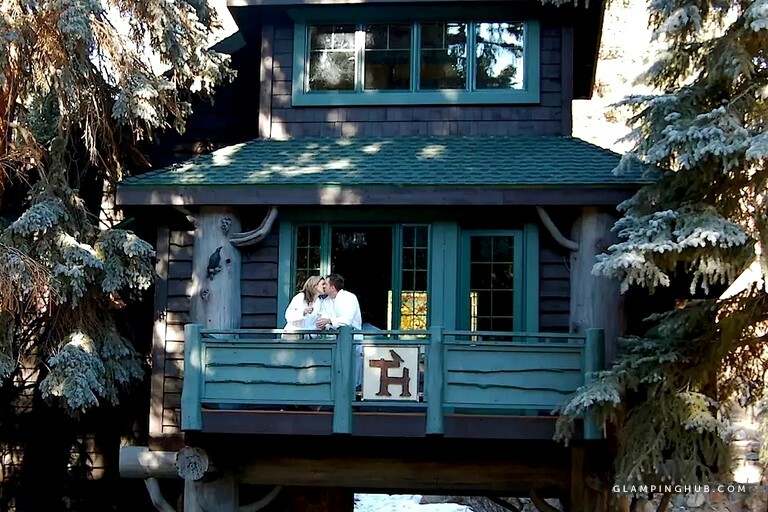 Escape to this unique tree house rental for a luxury getaway for two people to enjoy in Northern Colorado. 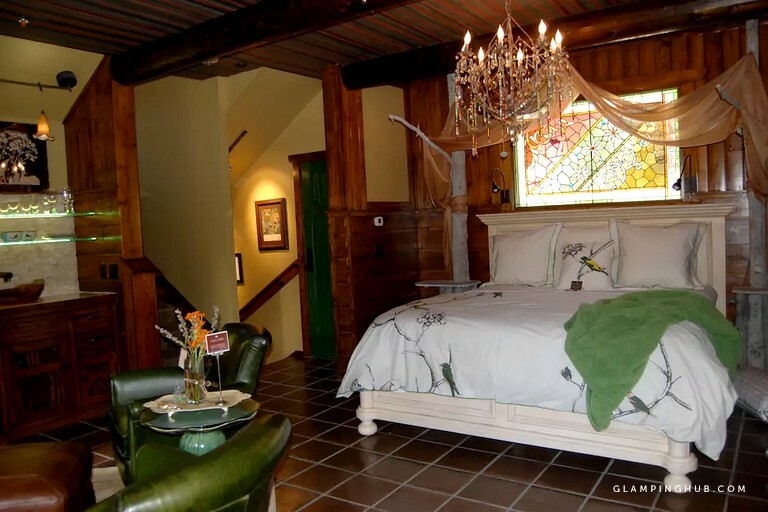 Live the fairy tale getaway in this glorious new tree house that boasts complete privacy with its 850 square foot, three level, two-story magical one-of-a-kind hideaway. 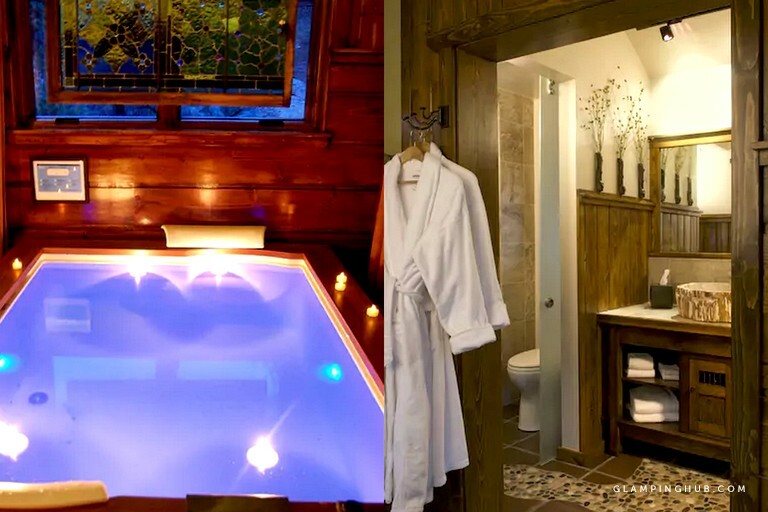 The ultra-luxe main floor features an aspen king-size bed, a sparkly chandelier, stained glass, custom iron and a stone fireplace, as well as a two person steam shower and plush bathrobes. 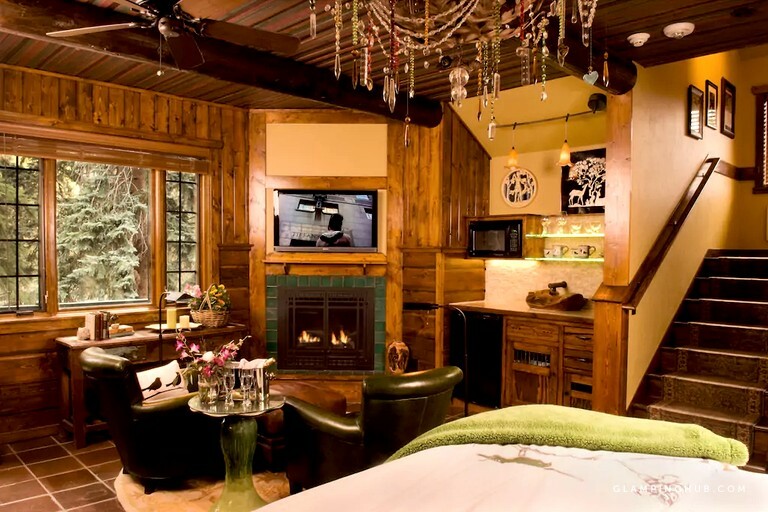 There is a lush indoor fireplace for glampers to relax in front during the colder winter months after a fun day of exploring, hiking, and skiing in the surrounding areas, additionally, there is also heating and air conditioning to suit all weather conditions. Breakfast in bed is available for an additional $25 fee. There is an abundance of activities available for guests while glamping at this property just west of Denver. The site is truly surrounded by mountains, woodlands, and wildlife, making it the perfect place for adventure, exploring, hiking, biking, photography, climbing, and horseback riding. There are plenty of things to do when traveling to Evergreen Colorado. 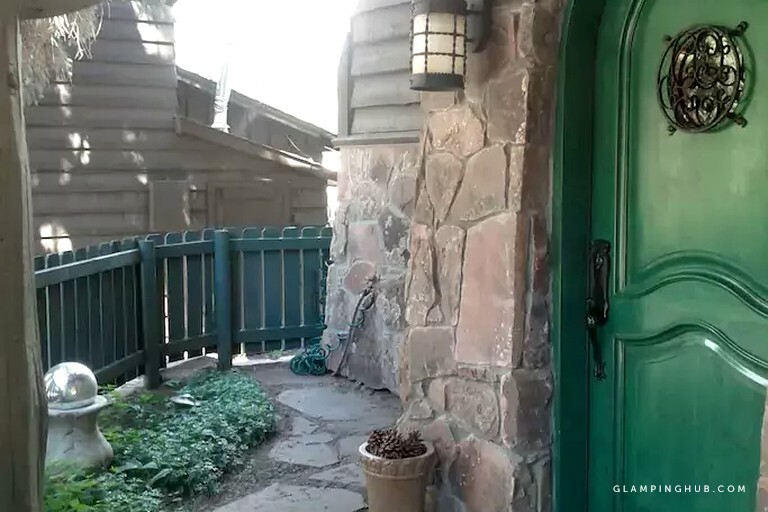 Nestled in the Rocky Mountains Evergreen is just outside of Denver, Evergreen is both beautiful and vibrant; the jewel of the community is just walking distance from the glamping site for both summer boating, or fishing and winter ice skating. The pristine area boasts abundant open space parks ideal for hiking, biking or snowshoeing. 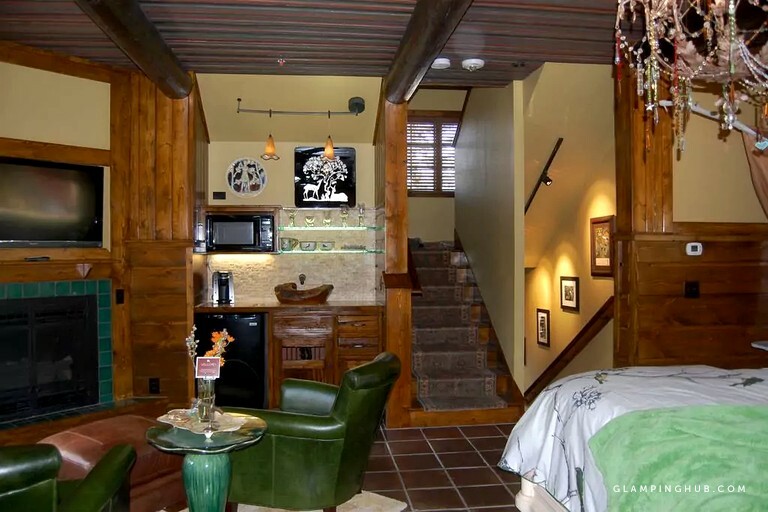 Stroll to the “Heart of Evergreen” downtown to visit the winery, unique shops, the famous Little Bear saloon and an eclectic variety of eateries all just walking distance to glamping accommodation. Visit the art galleries, historic museum, gamble mountain style or pamper at Tallgrass day spa. 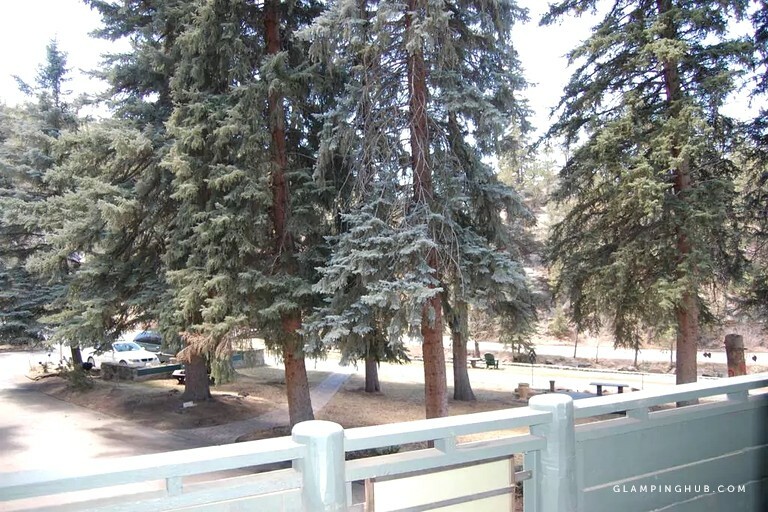 The hosts are happy to advise glampers to Colorado’s most famous “photo ops” or take advantage of Denver’s exciting offerings, just a 45-minute drive away. Or take a just take a 15-minute drive to the amazing Red Rocks Amphitheater and see a concert in the only naturally-occurring, acoustically perfect amphitheater in the world. Come breathe the freshest air, take in the bluest skies and enjoy the beauty of Evergreen at this award-winning glamping site. Colorado Springs is approximately one hour and 30-minutes from the site. Here, guests can check out Pikes Peak, or visit Seven Falls and view the gorgeous waterfalls. Cheyenne Mountain Zoo is a great place to take the kids and there's even giraffe feeding, or why not go hiking at either Manitou Incline, The Barr Trail, or Red Rock Canyon Open Space. The opportunities are endless when it comes to recreational activities in the area. Check-in is anytime after 3 p.m., and check-out is at 11 a.m.